The new SIGMA Model SBM Basket Mill offers grinding and dispersion capability which rivals that of a bead mill, while priced not much more than a simple disperser. All wetted parts are made of 304 stainless steel. The lift mechanism is hydraulically powered for reliability and variable speed is standard. The SBM is both economical and simple to use. It requires no adjustments and virtually no maintenance except for cleaning. Standard wiring is NEMA 12/TEFC. 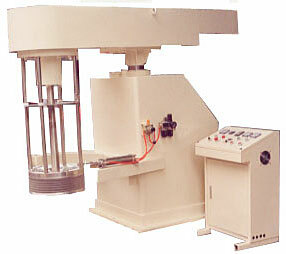 The machine is available with a water-jacketed tank from SIGMA, or the customer can use an existing vessel. The tank is rolled into position and held firmly by a pneumatically activated strap and clamp.